This unique collection of contemporary international public relations case studies gives the reader in-depth insight into effective public relations practice in a range of organizational contexts. The cases demonstrate the breadth of modern public relations practice and the increasing importance and sophistication of this function both in public and private sector organizations. 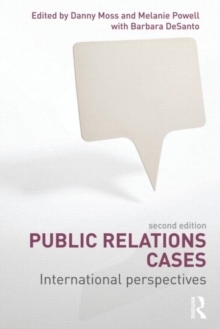 This second edition of Public Relations Cases builds on the success of the previous edition to offer new insights into the changing face of contemporary public relations and the development of PR and communication strategies. The book also examines:The use of social media and blogging as a communications mediumThe growing importance of corporate social responsibility programmesLocal authority identity changeHigh profile international charitable fundraisingSports sponsorshipProperty sector PR. Featuring cases from around the world, including the UK, India, Korea, Demark, Croatia and the US, this book is an invaluable resource for teachers, researchers and students working in public relations, corporate communication and public affairs.